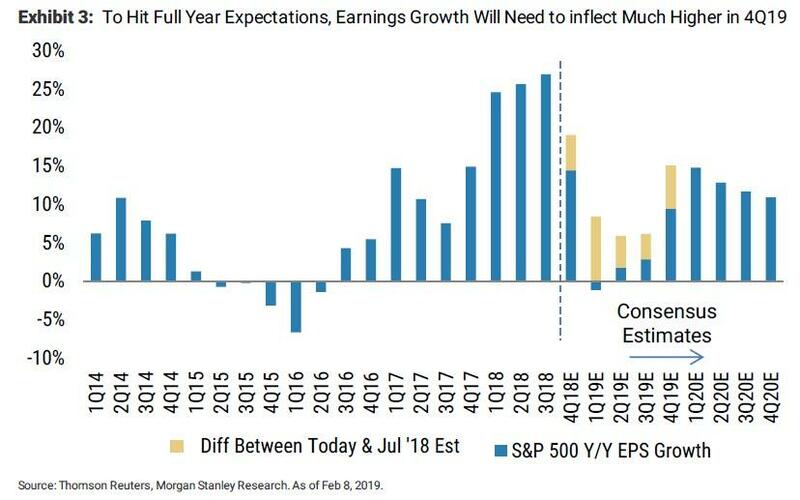 SOURCE: 02-11-19 - "Morgan Stanley: "The Earnings Recession Is Here""
The first quarter marked the largest decline in the bottom-up EPS estimate during the first month of a quarter since Q1 2016 (-5.5%). At the sector level, all eleven sectors recorded a decline in their bottom-up EPS estimate during the first month of the quarter, led by the Energy (-22.5%) and Information Technology (-7.3%) sectors. 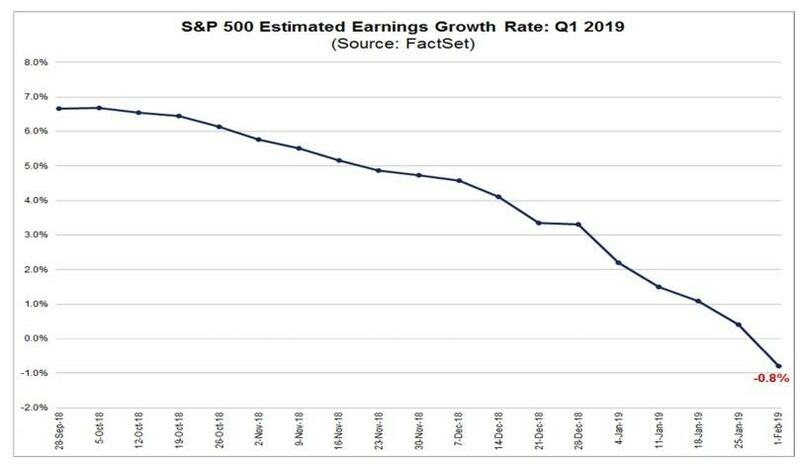 This could potentially mark the first year-over-year decline in earnings since Q2 2016 (-3.1%). 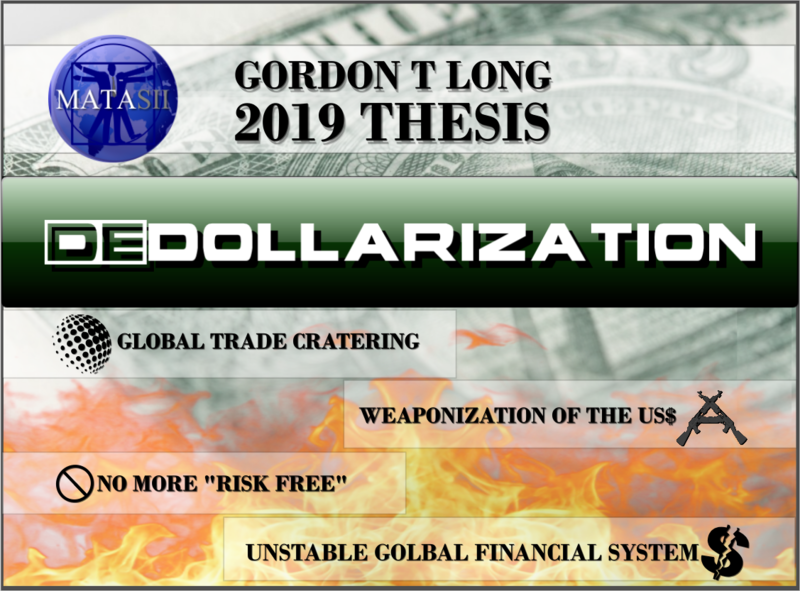 A 'hockey stick' is assumed in 2H19 that would bring the full year growth estimate to ~5%. We are still looking at a bumpy, range bound market at the index level and think investors should continue to try and take advantage of the swings in price in both directions. 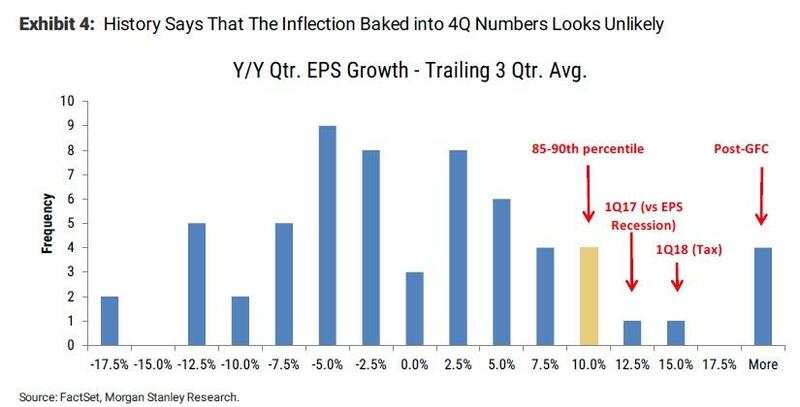 "if current estimates move in line with history, we could see a full year decline of ~3.5% in S&P earnings." 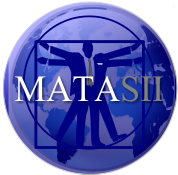 "our base case year end target of 2750 is a lot less exciting than it was a month ago." The lower rate environment provides support for year end target multiples, i.e., the Fed comes to the rescue again. One week ago, when looking at the dramatic collapse in consensus Q1 EPS estimates, we noted that the "profit party" is over and the days of near record earnings growth are about to end with a bang as a result of the recent barrage in profit warnings and negative pre-announcements, first and foremost starting with Apple, which issued a shocking guidance cut one month ago for the first time since 2001. 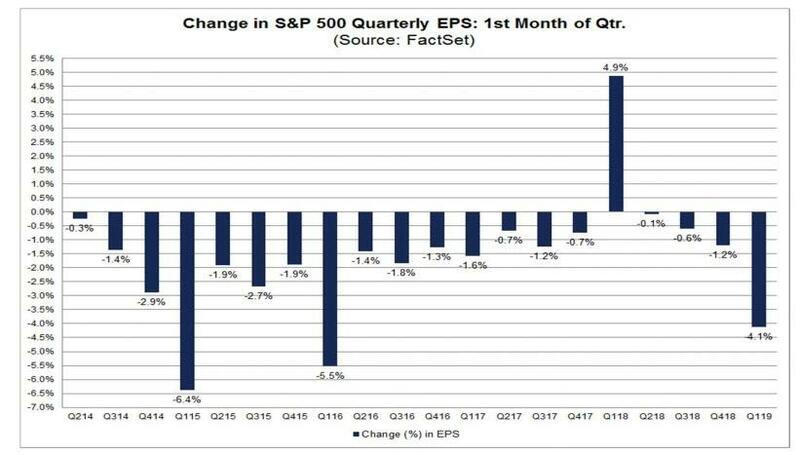 As a result, analysts have slashed their S&P500 earnings estimates for the first quarter, and the Q1 bottom-up EPS estimate dropped by 4.1% (to $38.55 from $40.21) during this period. MORGAN STANLEY: “EARNING REVISIONS HAVE BEEN SOME OF THE WORST WE ‘VE EVER OBSERVED” EUROPEAN EARNINGS ARE UNCHANGED OVER THE PAST TEN YEARS! !